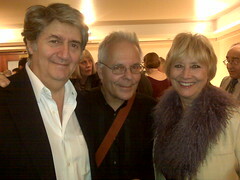 A tad hung-over this morning after a chocolate gateau of a birthday concert last night. 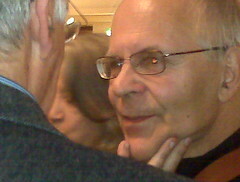 Stephen Kovacevich turned 70 and the Wigmore Hall was out in force to celebrate. As Stephen put it, succinctly: "Nobody wants to be 70, but if you have to be, this is the way to do it." Stephen and his team put on the glad rags, took off the brakes, and soared from 0 to 100 in moments. This was flying-display music, loop-the-loop bedazzlement, raw and wild and tender - Formula One playing in which the terror that a car wreck would happen any moment added to the adrenaline of joy that, in the main, it didn't. Pure emotion, sincere and at the same time completely irreverent, with never a hint of pomposity or self-importance - that's Stephen all over for you, and his friends gave as good as they got. The concert (packed to the nines) opened with the sort of performance that most gigs would be fortunate to conclude with: the Brahms Piano Quintet, starring our birthday boy and the Belcea Quartet - a purple Brahms patch with a Gypsy edge. A few rough moments, but who cared? The slow movement was deep velvet gorgeousness and in the scherzo they were in the flow and flying at full throttle. Next up in the Brahms & Liszt first part, Stephen and Martha's latest protegee and Borletti-Buitoni Trust wonder, Khatia Buniatishvili, 23, from Tblisi, Georgia. Liszt B minor Sonata - completely mesmerising, redefining the whole meaning of 'virtuosity'. There wasn't a safe moment in it: by turns theoretically too fast, too loud and too soft, yet throughout completely, hynotically overwhelming. There's no point playing Liszt if you're going to be safe about it, and Khatia seemed to turn herself inside out, giving more than you would imagine one person could ever give and be able to stand at the end. (She also proved that you don't need to be able to see what you're doing to play like that - I was sorely tempted to pass the poor girl my hairslide.) We hear she's been signed up by Sony Classical, so this looks to be the start of an auspicious career. But now there arrived, too, the inevitable car-wreck of this musical Formula One: and the victim was Martha's page-turner. If there is one thing more scary than being a journalist around Martha Argerich, it must be being her page-turner. The poor guy - he got lost, turned over two pages at once, looked utterly unnerved [tip for future: the thing to do if you're turning for a two-pianos concert is to note what the other pianist's page-turner is doing as usually they play from the same edition - if in doubt, co-ordinate...]. Having been on the receiving end of Martha's withering stares on one memorable occasion in Verbier, I wouldn't have liked to be in his shoes. But the music steamed ahead, unimpeded. Last but not least, house manager David King had his moment of glory - after providing an excellent warm-up comedy turn (roll over, Graham Norton), telling us all what to do and not do - in spite of which, two mobiles did go off at the quietest bit of the Liszt - he took to the piano himself and led the audience in a rousing rendition of Happy Birthday. And so, downstairs to party in the Bechstein Room, where Stephen seemed a very happy bunny indeed and a film crew brought in by his and Martha's daughter, Stephanie, was busy preserving the occasion. We should all be so lucky as to reach our eighth decade still playing our shoe-size, not our age: Stephen's ever-new edge of raw and mystical wonder is as great as ever. I hope he enjoyed his birthday party as much as the rest of us did. The concert is due for broadcast on BBC Radio 3 on 25 October and the Brahms and Bartok are intended for a Wigmore Live release in due course. Here's another review, from David Nice at The Arts Desk. Dear Jessica, I hope you will not object to a differing point of view apropos the Liszt sonata performance at Wigmore Hall last Sunday evening? Btw, Argerich and Kovacevich were never married. When their daughter was born they tossed a coin to see which surname she was to take and Argerich won it. To make up Argerich suggested Stephanie in order to cover Stephen's name too. Best, Hywel This is what I posted on Monday on the Yahoo Martha Argerich Forum. "It was a packed house filled with musicians and leading figures from the London arts scene.- I spotted Maxim Vengerov and Jonathan Biss but there were many more there. 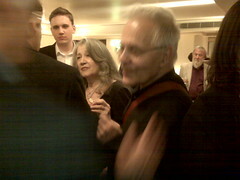 It was Argerich's first appearance at the Hall since 1965. Kovacevich and the Belcea began the concert playing the Brahms Piano Quintet. The score was wonderfully played with string versus piano balance sensitive and keen. It was a brisk, bold and emotionally sincere performance by a group of collaborative musicians all serving the composer first. Perhaps Kovacevich was not always in top form but he made a marvellous and heartfelt case for the piece. The performance was cheered to the rafters boding well for the remainder of the programme. The Liszt too ended with a rafter cheering ovation - perhaps even greater than that for the Brahms. To say that this astonished me would be an understatement. It was one of the fastest, loudest, over-peddaled accounts of the score I've ever heard. It was crashing turmoil, angst and neurosis throughout. Even the few moments of calm that she explored were not natural. It was a vulgar assault on the score and was complete car crash for me. Clearly I was in the minority as the audience brayed their pleasure at what Buniatishvili had delivered. Where was the tenderness that Horovitz and Zimerman find or the architectural shaping and expansion that Arrau, Richter and Brendel use to explore? Let's not forget that sitting backstage was one of the greatest exponents of this score, Argerich herself high priestess of colour, speed and attack and those vital ingredients when those parts of the score demand it - beauty, romanticism and poise. The far too constant loudness was unbearable. And to those of you that do not know the hall, it is a live acoustic seating less than 600. I can say no more. I didn't like it. After the interval we returned to our seats to see that the tiny Wigmore platform was filled with two pianos, four piano stools and squashed behind a battery of percussion instruments. There was a bit of a farce to begin with Martha finding it hard to get to her stool and then after a bit of a palaver she moved the page turner from her right side to her left side. To be fair to her it was one almighty squeeze for the artists and turners alike. After a moment of preparatory silence the four artists established a mysterious sound world almost immediately with all the right kinds of tension - unlike the wrong tension mined by Buniatishvili in the Liszt. I was fortunate in being on the right hand side of the Hall so able to see Argerich's hands. Always the greatest of pleasures. The only moments where the wrong kind of tension took place were those between Martha and her page turner. Several times she intervened to stop or correct an in motion page turn. Forgive me harking back to the Liszt but with far less 'noise' Kovacevich and Argerich's pianos found depth, colour, attack, loudness when required, emotional truth through sincere musicianship, an almost plain song like purity in those psalm like passages of the slow movement, which was superb. Ending with a rousing, thrilling third movement." Thank you, Herman - I will look that up right away! She's an astonishing musician.